In this tutorial, we learn how to place an image in text, one of Photoshop's most popular and classic effects. As we'll see, thanks to the power of clipping masks, placing an image inside text with Photoshop is simple and easy. I'll be using Photoshop CS6 here but this tutorial is also fully compatible with Photoshop CC (Creative Cloud). If you're using an older version of Photoshop, be sure to check out my original Placing An Image In Text tutorial. A copy of the layer appears above the original. Selecting a Solid Color Fill layer. 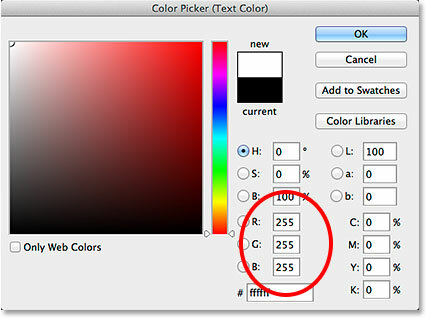 A value of 255 for the R, G and B values gives us white. The Layers panel showing the Solid Color Fill layer. The image is temporarily hidden by the Fill Layer. Dragging the Fill layer between the Background layer and Layer 1. The Fill layer now sits between the two image layers. Selecting a font from the Options Bar. 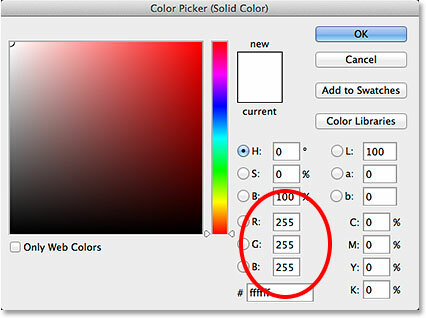 Setting the R, G and B values to 255. Learn all about working with type in Photoshop with our Photoshop Type Essentials tutorial! The Type layer currently sits above the image. Dragging the Type layer below Layer 1. The Type layer now sits below Layer 1. Clicking on Layer 1 to select it. Choosing the Create Clipping Mask command. Only the area of the image that sits directly above the text remains visible. The Layers panel showing Layer 1 clipped to the Type layer. Moving and resizing the text with Free Transform. The effect after moving and resizing the type. Selecting a Drop Shadow layer effect. And there we have it! In this tutorial, we learned how to place an image in a single word, or a single Type layer. In the next tutorial, learn the trick to placing an image in multiple text layers at once! Or visit our Text Effects or Photo Effects sections for more Photoshop effects tutorials!